Boots it unconvincingly back towards pitch. 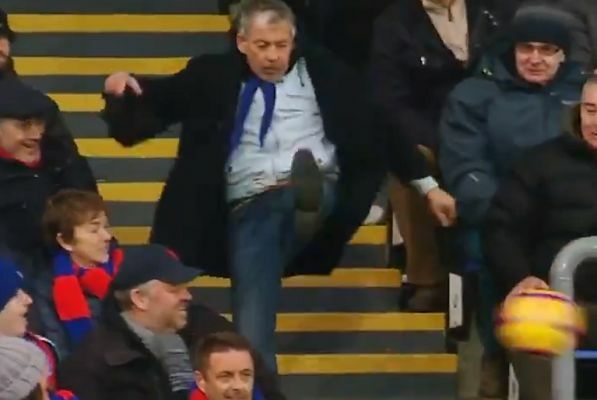 This Crystal Palace supporter struggled gamely to return the ball to the pitch from the stands during the 2-0 win over Fulham at Selhurst Park. Apparently wearing a string as a belt and cowboy-style neckwear, the Eagles fan removes his hat in order to carry the ball down some steps. To the amusement of those around him, he then kicks it low and unconvincingly back towards the field of play before soaking up the plaudits while returning to his seat. As he sits back down, he puffs out his eyes at the effort expended and quickly gets back into the spirit of fandom, angrily screaming “come on”. A Luka Milivojević penalty and Jeffrey Schlupp’s late goal earned Roy Hodgson’s side all three points in the match itself.